If I were only allowed to take one herb on a desert island it would be a toss up between garlic and ginger. 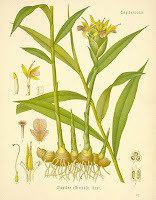 But with the current voluminous research on the humble rhizome, ginger would probably come tops in its versatility as both a medicine and a culinary staple. As traditional medicine in both China and India, ginger was hailed primarily as a warming herb – bringing heat to ‘cool’ conditions of the lungs and stomach. There is documented proof of its spread to the West, at least 2000 years ago, in the Roman Empire. Later ginger became the darling of the spice trade. As a contemporary herbalist, like the ancients before me, I have always loved the slow warmth that ginger brings to the body. It’s heat is very different to chilli, where the searing blast causes a sweat to cool us down. Ginger is the perfect winter spice. It has an affinity to warm the internal organs – such as the lungs, digestion and uterus. Here are some reasons why you should keep some fresh ginger on hand to drink or cook with. It can also be used as tablets or capsules, for an easy to take medicine. Anti-nausea: Ginger is a powerful anti-emetic (stops you from vomiting). What’s more it is considered to be safe and effective in treating nausea in pregnancy. Ginger has been used successfully to quell post-operative and chemotherapy induced nausea. It works well for motion sickness, so don’t forget to pack some ginger tablets the next time you’re at sea. Queasiness: A strong cup of ginger tea has been known to help the general queasy and biliousness that results from drinking too much alcohol or fatty food. Bloating: Ginger can ease bloating and flatulence, and is effective as a tea or tablet. Coughs: In India a spoonful of ginger mixed with honey is still a favourite remedy for a cough. Pain: Ginger has been found to be both a COX-1 and COX-2 inhibitor. Basically this means it is, amongst other things, antinflammatory and an effective painkiller – without the negative side effects of the pharmaceutical drugs that achieve this (such as Vioxx). Arthritis: Before this scientific validation of it’s antinflammatory properties, ginger has long been used as a remedy for rheumatism and arthritis. Period pain:Taking 2 ginger tablets is a fast and effective treatment for some types of period pain. Topically, in conjunction with a caster oil pack – naturopaths and herbalists use ginger to treat adhesions such as in endometriosis and other causes of painful periods. Ginger is considered safe to consume as a food but as a more concnetrated medicine (such as a tablet, capsule, tincture or fluid extract) high doses are theoretically problematic for people with bleeding disorders, especially if taking anti-clotting drugs like warfarin. Look for plump, fresh roots where the flesh hasn’t dried out. Ginger tea: grate 1 tsp of ginger per cup of water. Simmer on the stove for about 10 minutes, as a root this is more effective than just steeping in a teapot. Strain and add a little honey as straight ginger can be acrid to drink. In cooking: fresh ginger is delicious in stir fries, curries, steamed fish, in soups with orange vegetables. It is a favourite in many sweet foods, such as gingerbread – however the sugar, fat and flour content tends to counteract the benefits. Good quality, naturally fermented ginger beer that hasn’t been over sweetened, can be useful for the early stages of nausea or indigestion. For more ideas, explore the recipe archive. Since broadcasting this show about ginger in 2007, there’s been so much research into the many medical uses for this amazing herb. Promising research on ginger includes: decreasing obesity by helping modulate the microbiome, healing stomach ulcers, impacting gene expression and decreasing inflammation in rheumatoid arthritis – and much more. For the latest ginger research, try a key search on Medline.